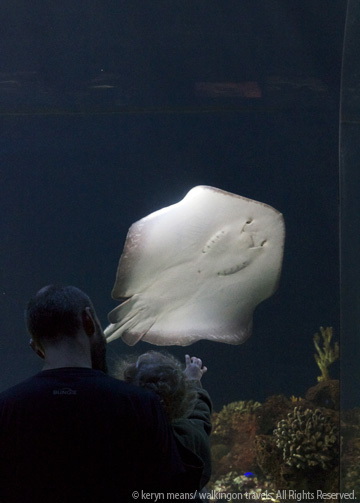 Every aquarium visit starts out the same in our family. Dek runs from tank to tank saying hello to all of the smaller fish. He giggles and laughs his way through starfish, anemones, clownfish, and fish I have never been able to name. Then come the big tanks. Dek still isn’t sure how he feels about those. It all started at the Osaka Aquarium. Dek would not go within 2 feet of a tank, no matter what size the fish were. He could not grasp the concept that there was glass between him and the fish. Those critters looked like they wanted to take a bite out of him and he wasn’t taking any chances. After almost 3 hours wandering and watching a family of little girls bang on the tanks, he finally got up close and personal with some fishy friends. On a later visit to the Seattle Aquarium Dek was much more adventurous. The fish didn’t scare him as much. He even poked a finger into the tide pools. I thought we had turned a corner since he was a little bit older. Apparently not. Dek was so excited to visit the Vancouver Aquarium. I had been talking it up for days before we took off on our weekend adventure. We were going to see octopus, sharks, dolphins and whales. Oh sure mom, that all sounded great on paper and on the TV, but when reality hit, his old fears set back in. As we entered the rain forest exhibit, a huge arapaima was there to greet us. Dek immediately jumped into Mike’s arms and would not let go until we were well away from the gigantic beast. He was convinced he was about to be eaten. We made the loop around the rain forest, saying hi to parrots and other fascinating creatures. Dek began to relax and have fun once again until we completed our loop. He took one look at the arapaima tank and jumped back onto Mike. Naturally the tropic zone was next and that meant sharks, rays and sea turtles. Oh yeah, and a very large tank. Dek was once again lured into the exhibit by smaller fish that defied our imaginations. I mean really, some of these guys looked amazing, and just a bit strange. My favorites were the clownfish, and thanks to Pixar, Dek was quite enamored with this little fish as well. We had to find Nemo a lot. We almost lost Dek a few times as he darted in and out of tanks checking out what other creatures were in this exhibit. And then he saw the shark tank. Back into Mike’s arms he went. We decided to take tackle Dek’s fear in baby steps. Mike held onto Dek and stood well away from the tank. Mike loves sea creatures great and small. He talked up the “very cool” sharks and “super awesome” rays that swam by. A huge “wow” popped out when the sea turtle lumbered by. OK, Dek could handle that, so Mike took a few steps closer. Dek cringed back, but kept peeking up at the tank. His curiosity was winning out. Mike finally made it all the way to the tank, within touching distance, but Dek would not go that extra step. That was OK. He had conquered a little of his fears and was mesmerized by what he saw. He just needed a little extra reassurance from dad. Oddly enough the dolphins, beluga whales, seals and otters were not a problem for Dek. The dolphins were understandable since we saw them via the underwater viewing stations in the children’s play area, Clownfish Cove. Like all children’s areas there was a certain amount of chaos, but Dek is a natural at chaos and holding his own by now. I just needed to keep an eye on him and make sure he didn’t bully any of the younger kids. Outside we could look down into the dolphin tanks, watch the beluga whales come up for air and saw the seals coming in for their mid-day training session. By now Dek was pretty much done. Lunch and naptime were looming over our heads. He didn’t really spare many of the animals a second glance. I needed to see the mammals before we left though. They were my favorite part! The beluga whales in their quiet glory sailed by, holding their breathe longer than I could ever imagine. Dek and I watch the otter scrub his face and pretended to scrub our faces right along with him. Otters have always been Dek’s favorite at the zoo, so it wasn’t hard to get him to stop for more than a few seconds. 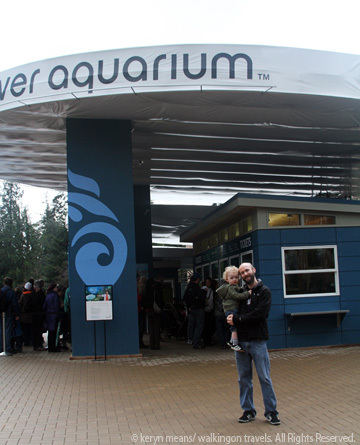 With our first look at the Vancouver Aquarium complete we headed out in search of food. There is so much we missed during our visit, but that just means we have to go back. 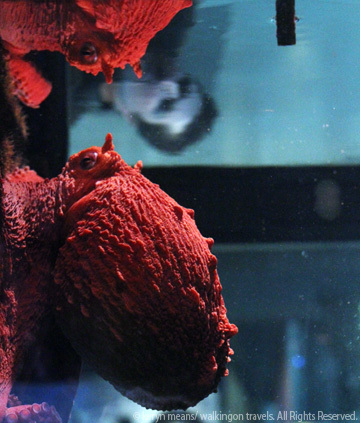 We got a good look at the highlights and even a few creatures most people would miss on their next visit as they prioritized different tanks than we did. I’m just so glad that Dek was able to tackle a small part of his aquarium fears. Hopefully our next visit will just build on the progress we made. And if not, oh well. Dek still proved that he could have a lot of fun even if a little fear is in the mix. Our first trip to the Vancouver Aquarium was education and exciting to say the least, but now it was time for a nap. 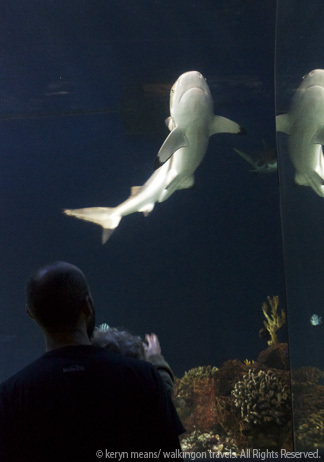 Try to go on a weekday or as soon as the aquarium opens in the morning. If you can’t swing that then go later in the day. The crowds gather quickly. Discounted tickets are available for those meeting certain criteria. Check the website to see if you apply. Drive: from most downtown locations, take West Georgia Street north into the park. Follow signs for the Stanley Park exit. From there you will see signs to the aquarium. Parking is available adjacent to the aquarium and throughout the park: $10/day April-September and $5/day October-March. Visa and Mastercard along with coins are accepted in the parking meters. Bus: the #19 bus runs along West Pender Street and into the park. Bus fare is $2.50/person. Exact change is needed. Walk: 15-20 minute walk from Downtown. Head up the Seawall for a beautiful view as you make your way into the park. 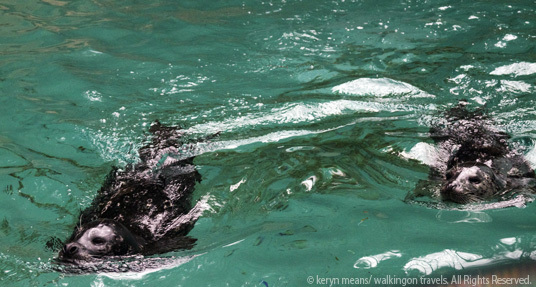 Strollers are welcome at the aquarium, but you may end up using it to haul your purse and camera bag more than your kid. If you have a baby, stick him or her in a carrier. It will be easier to navigate the crowds if you are there at peak times. For more Know Before You Go information check out our Vancouver, BC page. Your pictures are stunning!!!! I love the first few!! Thank you for linking up!! You are the best!! Love the jelly fish pictures! I really don’t like them in wild, but in aquariums with the right lighting the really look otherwordly cool. Great photos! I’m glad Dek enjoyed himself despite his fear – I’m not to fond of some of those sea creatures myself. 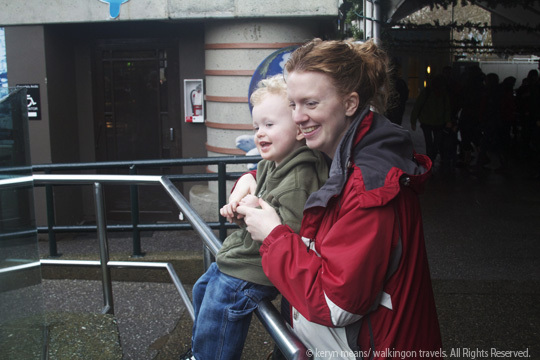 I love the Vancouver Aquarium and would love to go back – Emma can’t remember it very well. My favourite there is the beluga. The photos are great. 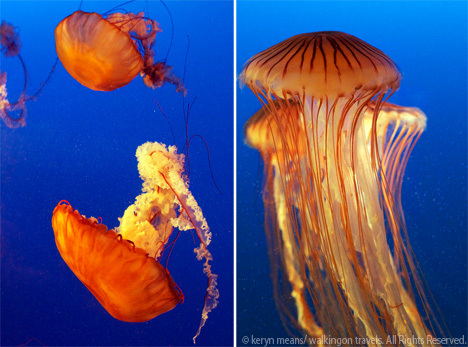 I particularly love the jellyfish photos. Amazing. I love photographing jellyfish. I must have at least 10 shots from one tank. Pairing the blue background with an orange jellyfish is always photo magic. The jellyfish shots creep me out. 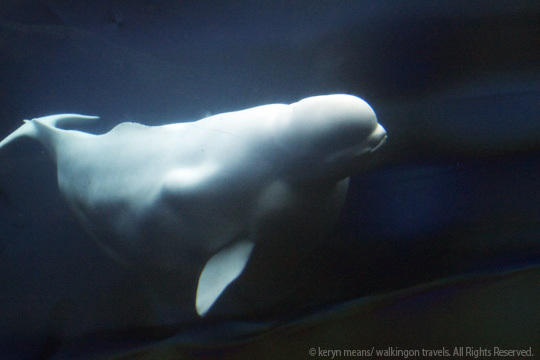 Part of the year end trip for Grade 7 at my kids school is an overnight stay inside the Vancouver Aquarium. I don’t think I’d get a lot of sleep knowing that those jellyfish are around, even if there was glass between me and them. Dek has it right though, the otters are the coolest! Took me awhile to figure out what those burgundy colored blobs were till I saw the eyeball and figured out it was an octopus. Creepy looking. It looks like a great time, although I am not quite sure our almost three year old would have the gumption to get up to the glass either. Beautiful pictures! 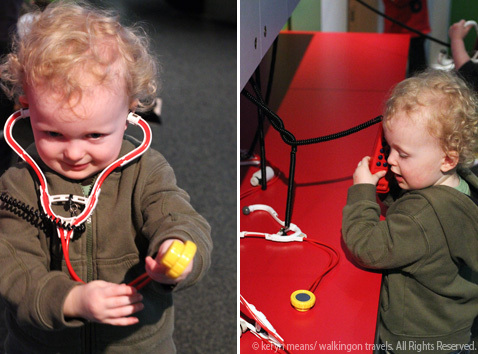 Looks like you had fun:) Love love the pictures-especially the beluga!